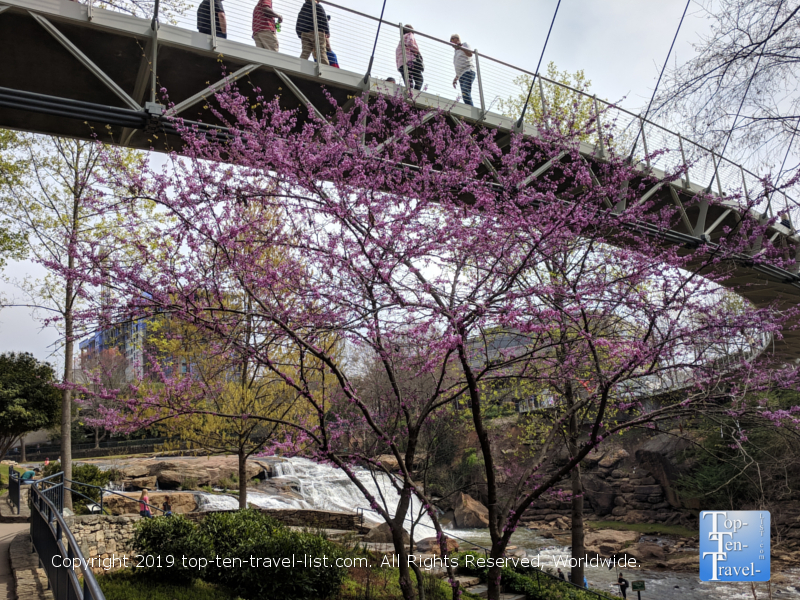 A Guide to Exploring Downtown Greenville, South Carolina - Top Ten Travel Blog | Our experiences traveling throughout the US. Downtown Greenville, a former textile community, is now a manufacturing powerhouse with companies like BMW, GE, & Boeing being drawn to the area. 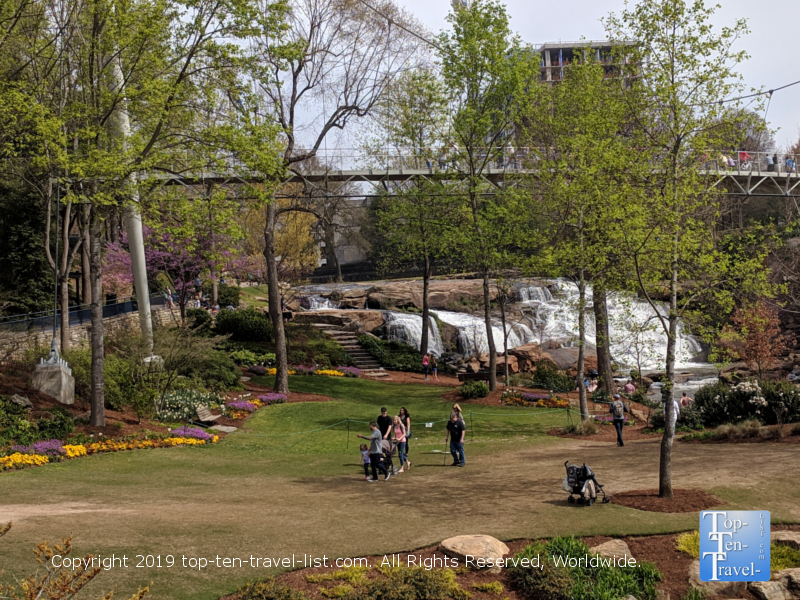 Not only is Greenville one of the fastest growing cities in America, it is also quickly becoming one of the most popular vacation destinations in the Southeast. 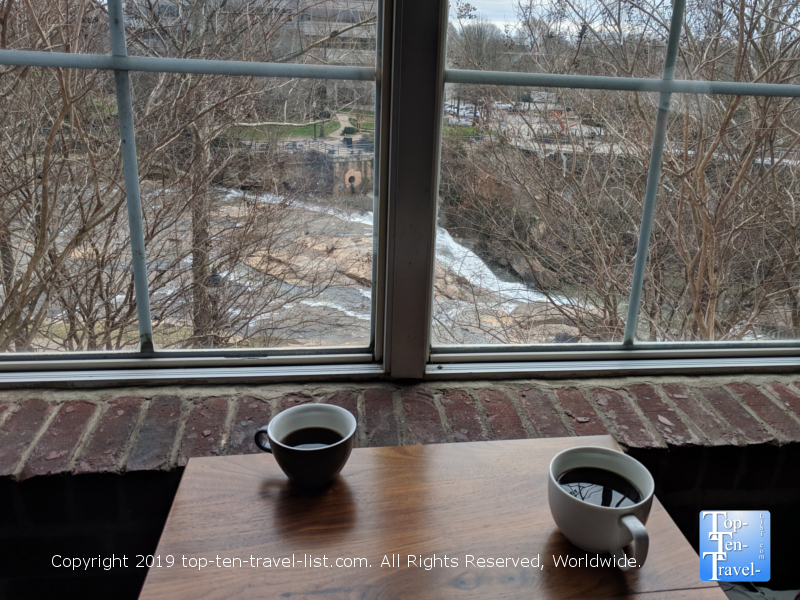 With a vibrant downtown, a tranquil river park & waterfall, several small museums & theaters, interesting boutique shops, and plenty of local restaurants, Greenville is frequently regarded as one of the best weekend getaways in the South. 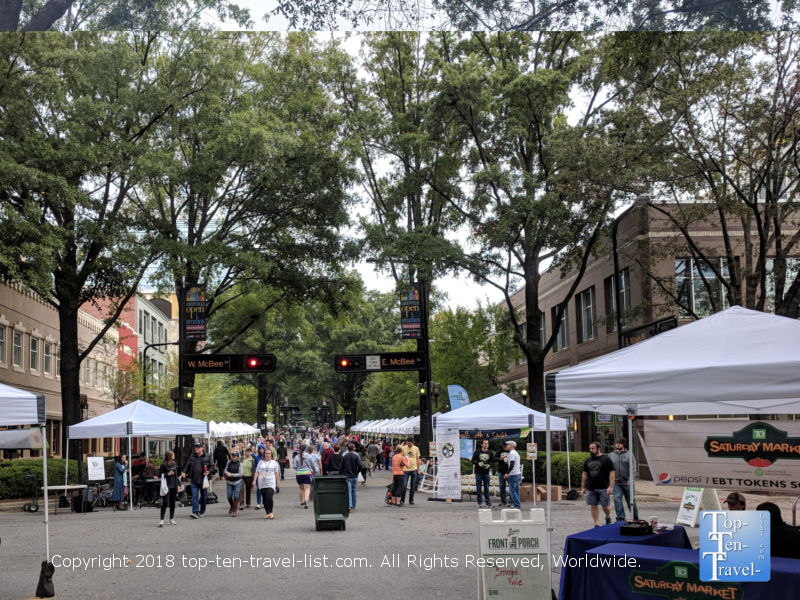 Numerous reputable sources have ranked Greenville’s quaint tree-lined Main Street as one of the best, and thus, the area is bustling with people and events all year-long. On any given weekend, especially during the warmer spring and summer months, you can expect to find an interesting event going on downtown. 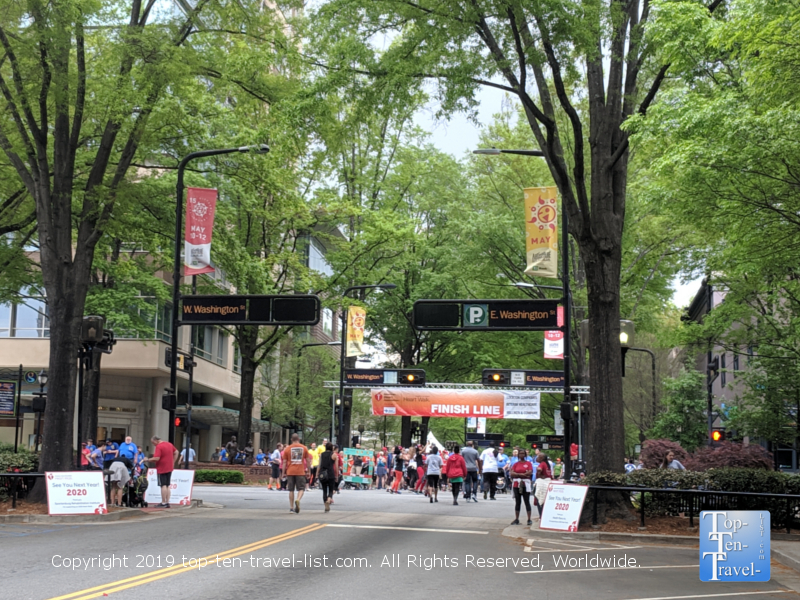 Pictured here is the Upstate Heart Walk, a non-competitive 1 or 3 mile walk which finishes down beautiful Main Street. This is a great way to support a great cause while also getting in a fresh workout! Greenville became “that” Greenville amongst many other cities with the same name due to a great marketing campaign and word of mouth. 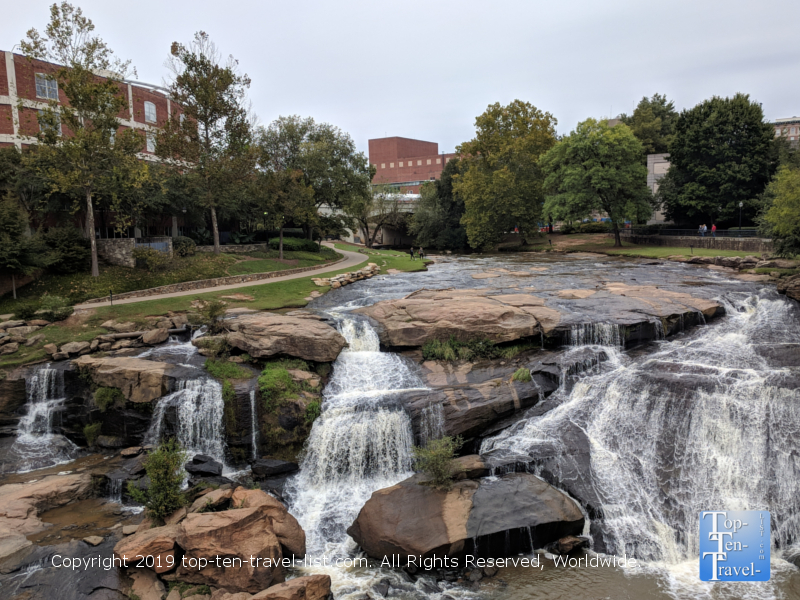 As more people spread the word about Greenville’s quaint downtown, beautiful waterfall, and foodie scene, others began to visit and spread the word themselves. Today, Greenville, SC, is by far the most popular of 30+ Greenvilles. 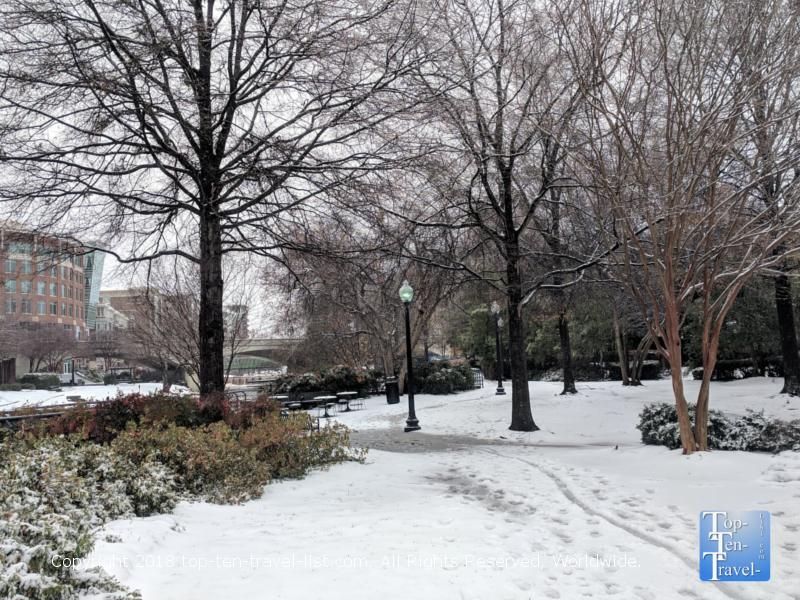 The #YeahTHATGreenville marketing slogan can be found just about everywhere today- on social media, in magazine advertisements, even on TV commercials. 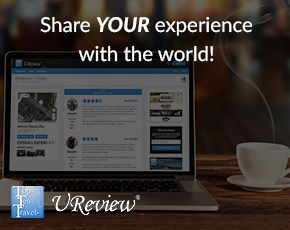 People love Greenville and are proud to share their travel stories via the popular hashtag. This rapidly growing area of the Upstate SC is becoming well-known for its’ diverse foodie scene and thriving downtown and the word is spreading fast. 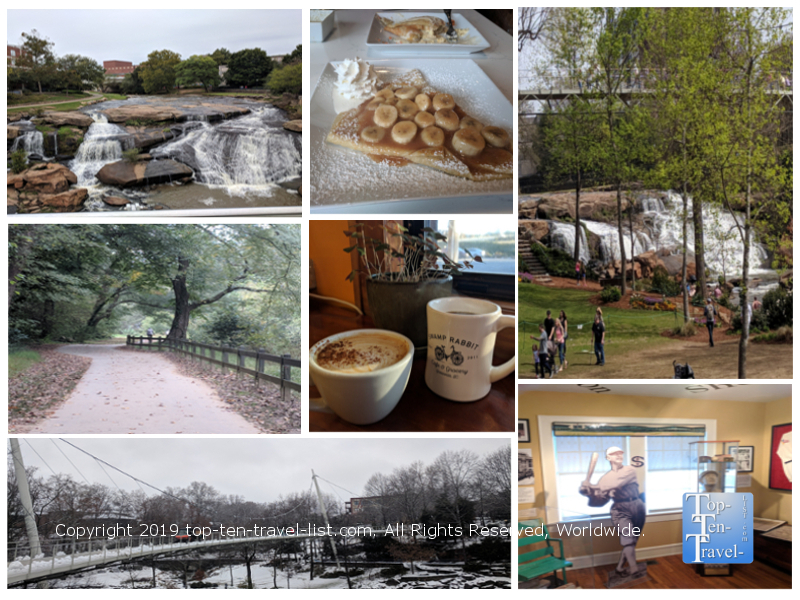 Below is a handy little guide on what to do, see, and eat while visiting downtown Greenville! 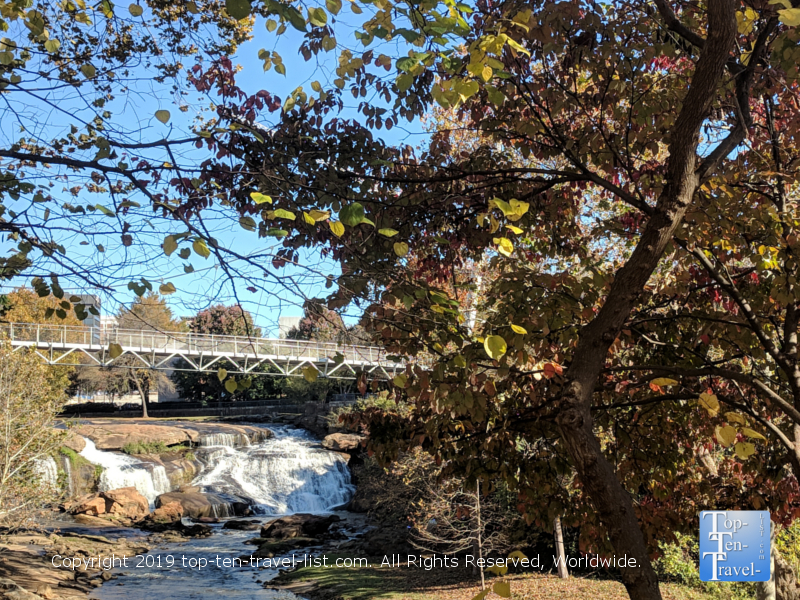 The oasis of downtown Greenville is beautiful 32 acre Falls Park on the Reedy, a beautiful riverfront park home to a waterfall, nature trails, and gardens. 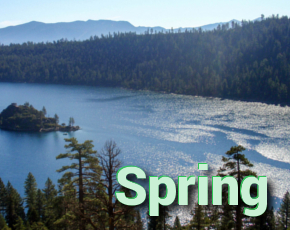 Tons of flowers and colorful trees are in bloom beginning in late spring. In autumn, the trees are alive & shimmering with the golden hues of the season. Fall color was a bit drab in 2019, however, that fall feeling is still in the air. Winter, with barren tree landscapes and the occasional dusting of snow, is peaceful and solitary. The standout feature is 355 foot Liberty pedestrian bridge which wraps around the waterfall. This is the prime spot for a photo worthy unobstructed view of the falls. A quaint French bistro overlooks the falls and is the perfect place for a light breakfast or lunch. This restaurant features a gorgeous patio which has earned it a place amongst the most romantic restaurants in the country (CNN, Feb. ’19). Al fresco dining at Paserelle is very popular during the warmer months! Also located in the vicinity is a popular coffeehouse/gelato shop with a cozy interior overlooking the falls. If you would rather enjoy a walk in the fresh Southern sunshine, grab a coffee-to-go to accompany you during your park stroll. 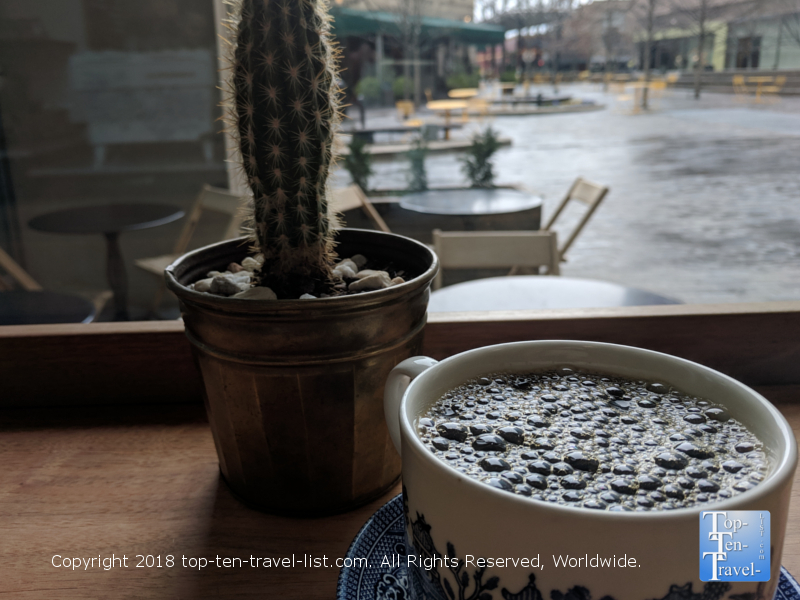 Spill the Beans – enjoy a cup of coffee with a great view! Summer is the prime time in terms of scenic beauty, although on the downside, also the busiest time of the year as tourists flock to the area to enjoy the park and alfresco dining. Winter, on the other hand, offers its’ own unique beauty, with the added bonus of next to no crowds. Temps are typically very brisk, skies usually overcast and/or rainy, with the odd snowstorm or 2. If you are not a fan of crowds, this is the time to plan your visit. 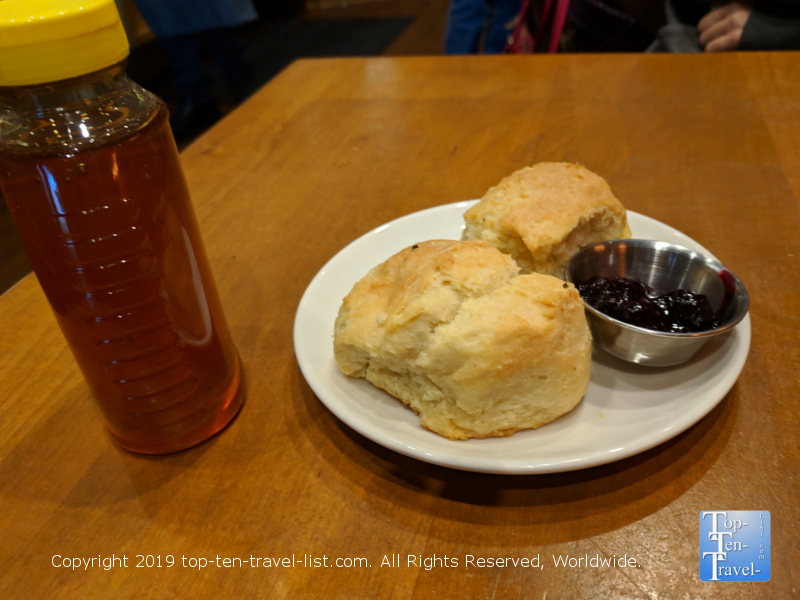 Tupelo Honey is home to the best biscuits in town. Top then with a little bit of honey or jam! Downtown Greenville has been making headlines in recent years for its’ foodie scene. The small South Carolina charmer is being referred to as one of the best foodie cities in the South, joining the likes of Austin, Asheville, Nashville, New Orleans, and Charleston. As an added bonus, most Main St. restaurants offer outdoor patios so you can dine al fresco. Various ethnic restaurants, from Greek, to Indian, to Italian, to Japanese can be found lining Main Street, and of course, there is more than enough Southern style BBQ and biscuits to go around. More than 30 new restaurants opened in 2017 alone – a big accomplishment for a city of just over 60,000 residents. Sully’s Steamers – Unique steamed bagels available in all sorts of creative combinations, topped with vegetarian and/or carnivorous selections. Gluten free and vegan selections also available! 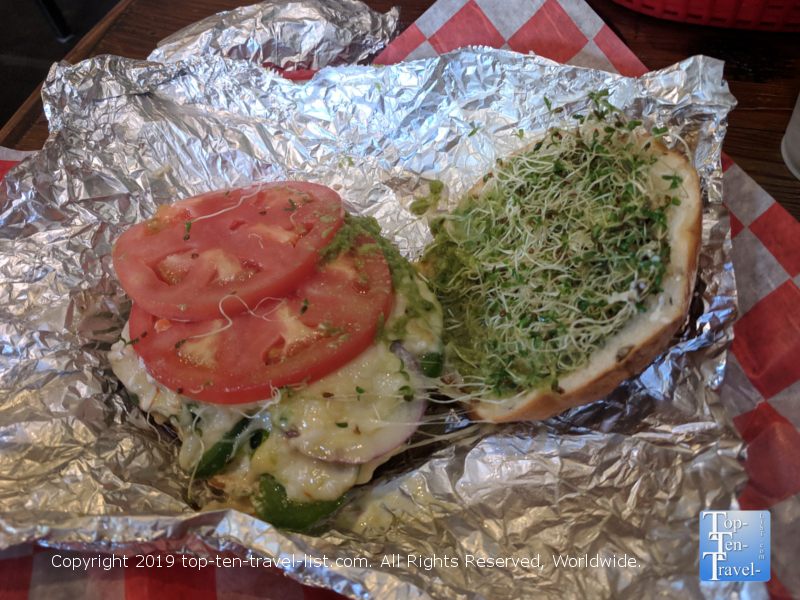 My personal favorite is the Green Vegas featuring veggie cream cheese, Swiss and Gouda cheese, avocado, lettuce, sprouts, and honey mustard. You will need tons of napkins to enjoy Sully’s loaded bagels. Fortunately, the mess is worth it! Biscuit Head – A very popular Asheville based establishment known for its’ gigantic biscuits (“as big as a cat’s head” as their slogan goes) and creative jam and honey bar. This place is super popular with a line outside the door right at opening, and oftentimes, throughout the morning! Get here early or be prepared to wait a long time – fortunately they have free coffee to keep you company! The best way to go is to order a plain biscuit and enjoy all the creative toppings via the jam & honey bar. 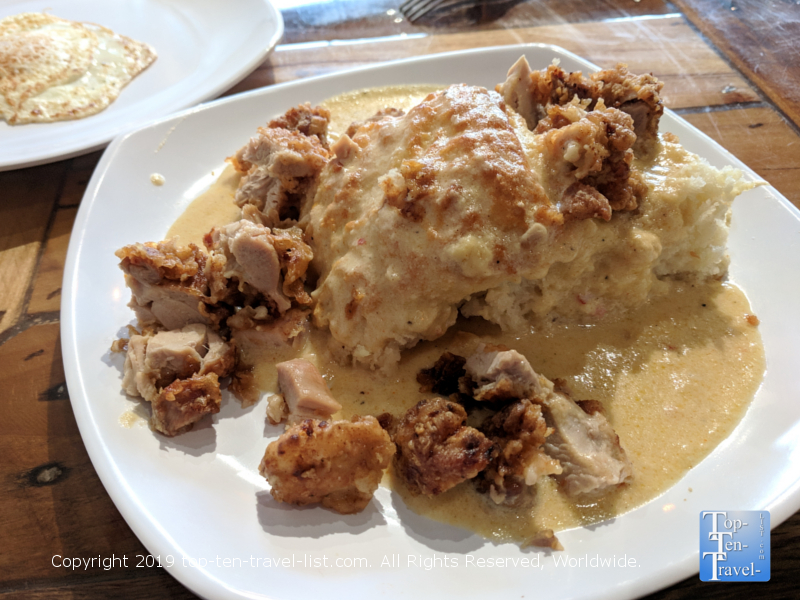 Biscuit Head offers a number of unique gravy flavors (shown here is the Fried Chicken), or you can try several via a flight. 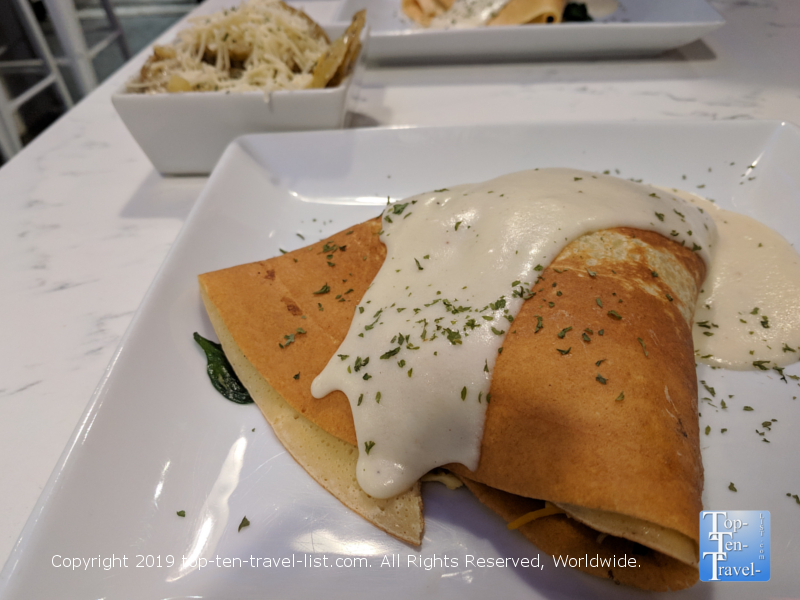 Crepe du jour – Excellent crepes available in both sweet and savory combinations, the best au gratin potatoes around, plus terrific coffee from Carolina roaster Counter Culture. 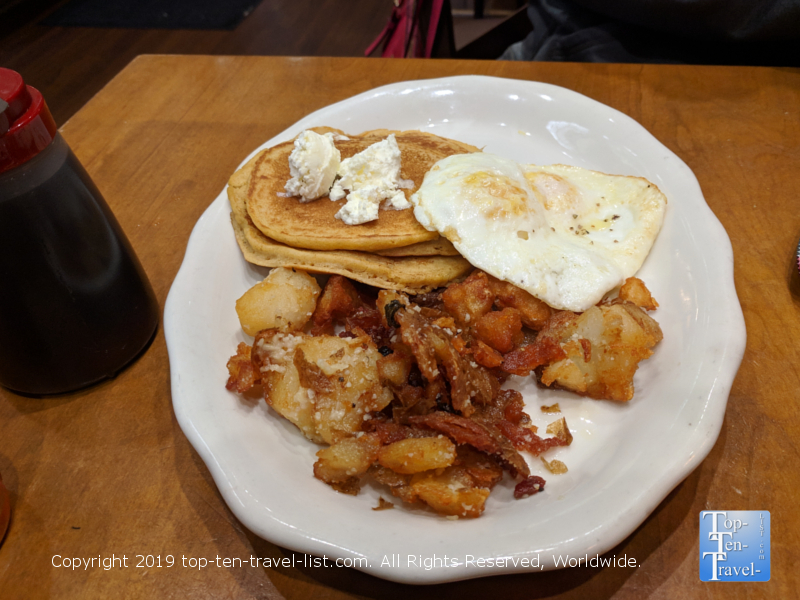 Tupelo Honey – A popular Southern breakfast chain featuring regional inspired fare including Sweet Potato pancakes and amazing homemade biscuits. Tupelo offers a great make-your-own breakfast deal where you can pick 3 items for just 10 bucks. The Sweet Potato pancakes are amazing! 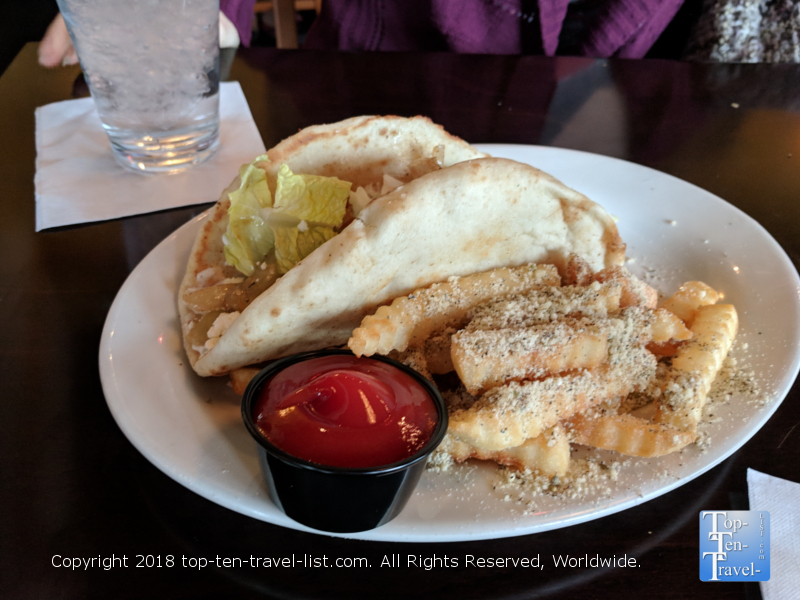 Greektown Grille – Best Spanakopita in town, delicious pitas and amazing seasoned house made french fries – by far the best in town! 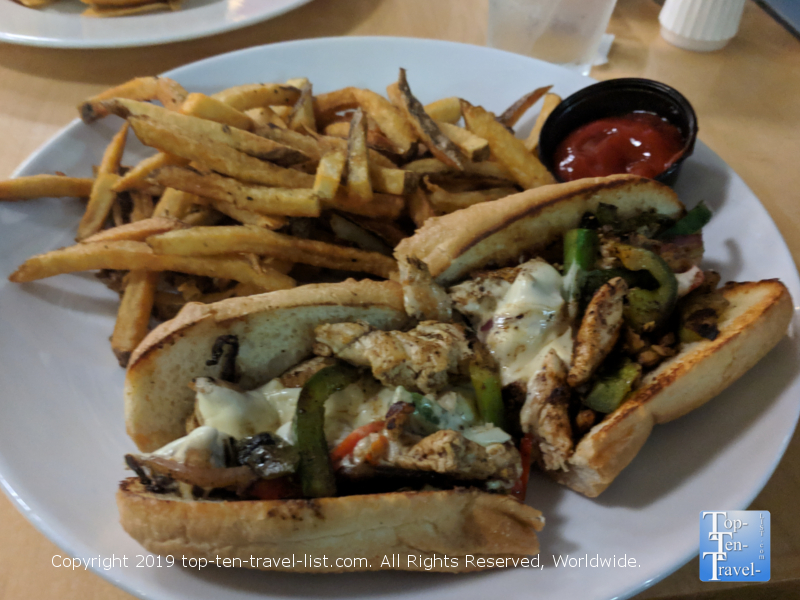 Rick’s Deli – A simple casual deli with excellent housemade sandwiches, delicious deli sides, and a comfortable laid-back ambiance. Nice patio for the summer season! Chicken chili cheese steak with the best homemade fries! 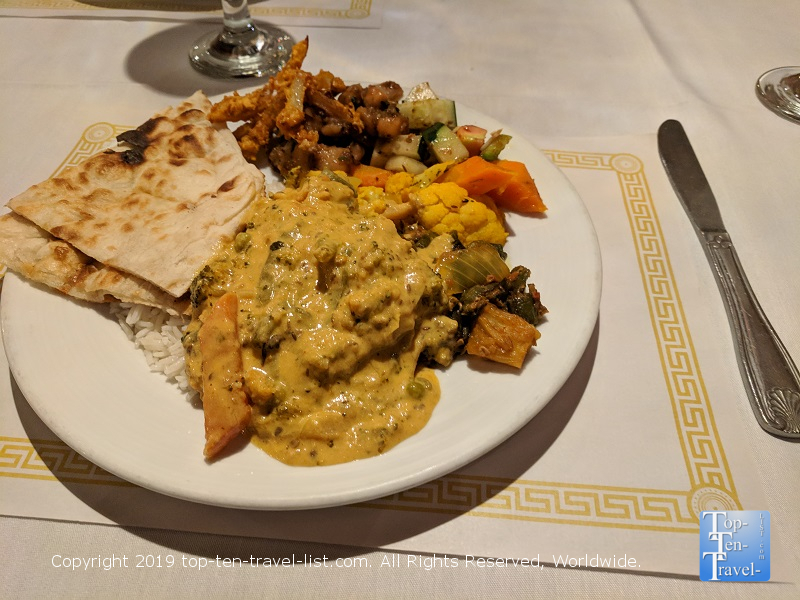 Handi Indian – A great choice for those who love really spicy Indian food. Great lunch buffet with tons of tasty (and really spicy) options for just 10 bucks. 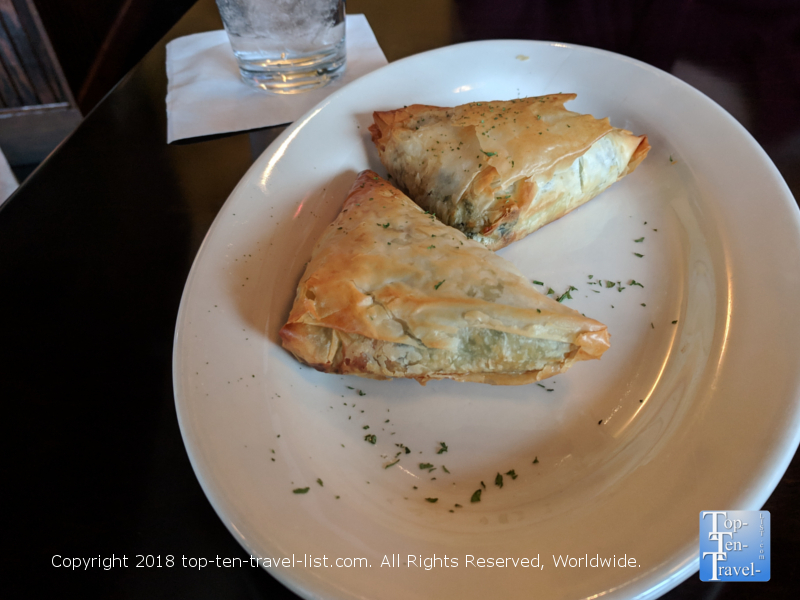 Excellent Naan bread and samosas. Lots of vegetarian items on the buffet lineup. 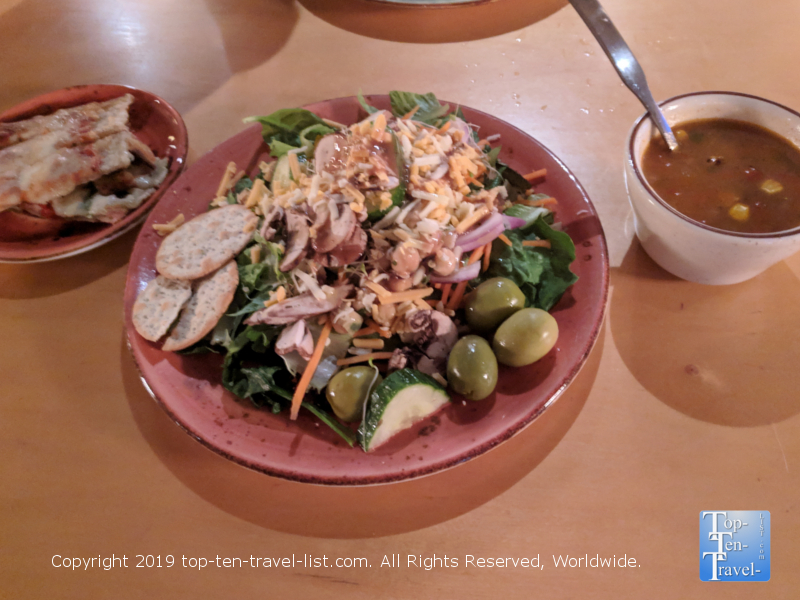 Roost – Located inside the Hyatt, this local farm-to-table gem offers a fantastic weekday Harvest soup and salad bar, featuring fresh local produce and homemade soups. Roost offers a fantastic farm-to-table lunch buffet weekday afternoons. Here you can enjoy a all-you-cat-eat salad bar (fresh local produce, homemade salad dressings), along with 2 homemade soups and pizza breadsticks! A great deal at just 10 bucks a person! Yes, there are several Starbucks’ locations downtown including a really nice location inside the Hyatt. However, if you prefer to support local businesses, there are a number of great independent roasters which rival the big chain. Seemingly everywhere across the country today, these local coffeehouses are impressing locals and visitors alike. 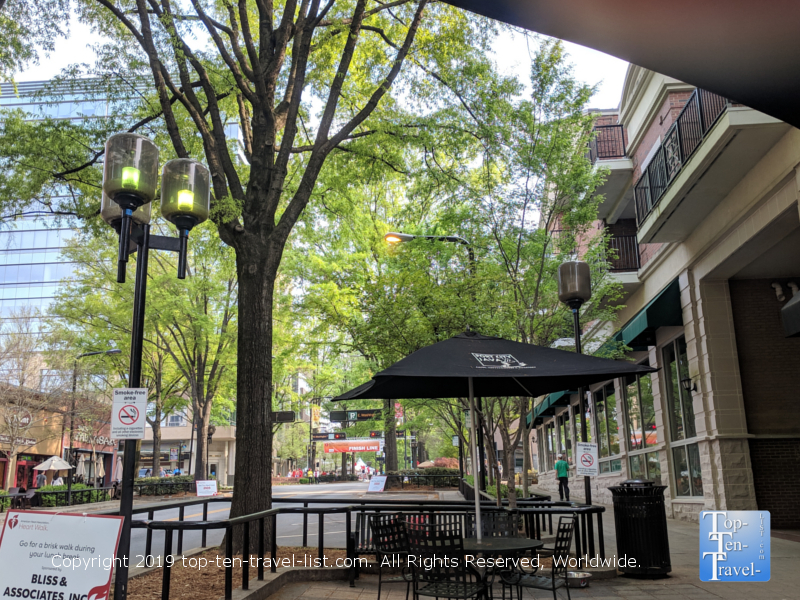 These quaint patios provide a fantastic place to people watch and enjoy the Southern sunshine. Al fresco dining is extremely popular during the summer months. Even most of the coffeehouses offer outdoor seating. Port City Java (pictured below) offers the best spot to sip and relax while taking in the action on Main Street. Port City Java – Port City is a Carolina based roaster which started in Wilmington, NC. 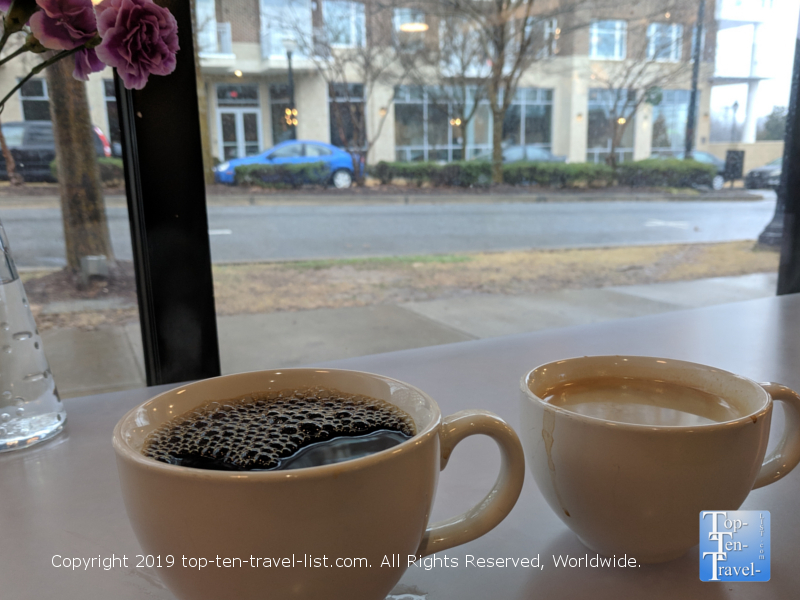 They serve a delicious light and medium roast everyday, a full espresso menu, and also the best homemade muffins in town – try the Red Velvet if available! 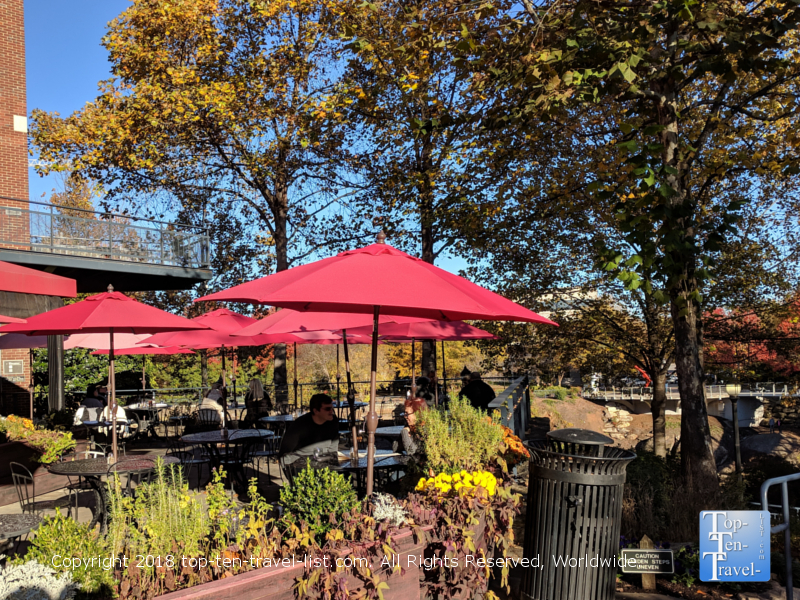 This is where you will find the friendliest baristas in town and the best outdoor patio for those mild summer mornings. Bonus: they are the only shop to offer free refills! 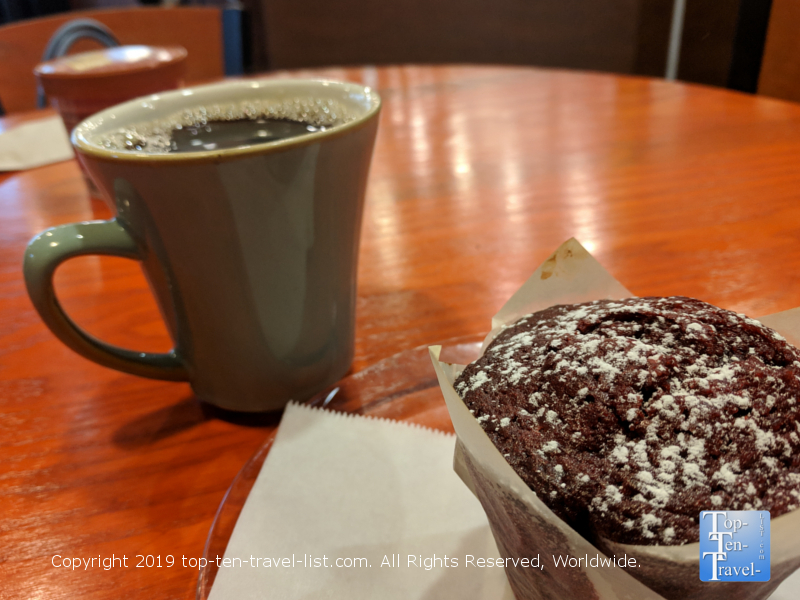 The drip coffee is always fantastic at Port City – plus their muffins are amazing! Methodical – This is the best coffeeshop in terms of pure quality, and not surprisingly, has been ranked one of the best roasters in the Southeast. They source high quality beans and use only the best equipment. The attractive modern 2 story layout and vintage record player give it that “coolness factor” over other places in town. Brewing methods offered include Siphon, cold brew, espresso, French press, and more. If you are a coffee connoisseur, you will definitely want to give Methodical a try. 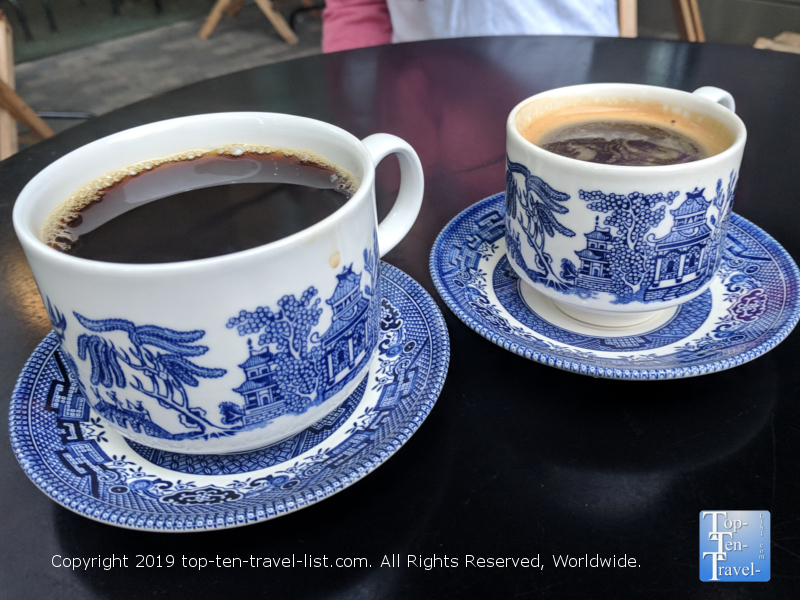 Methodical serves all drinks in the prettiest Blue Willow China mugs – the presentation definitely trumps other local coffeehouses. West End – This coffeehouse is located on the quieter side of Main Street, and thus, not nearly as hectic as the others. The ambiance is not as exciting, however, it’s a good choice if you are seeking a bit more peace. They offer a number of unique specialty espresso based drinks including a “Dublin Downtown” featuring espresso, vanilla, Irish cream, and steamed milk. Grab a window seat at West End and leisurely sip your espresso beverage minus the crowds! Up on the Roof – This tourist favorite features amazing views of Greenville and the surrounding landscapes. 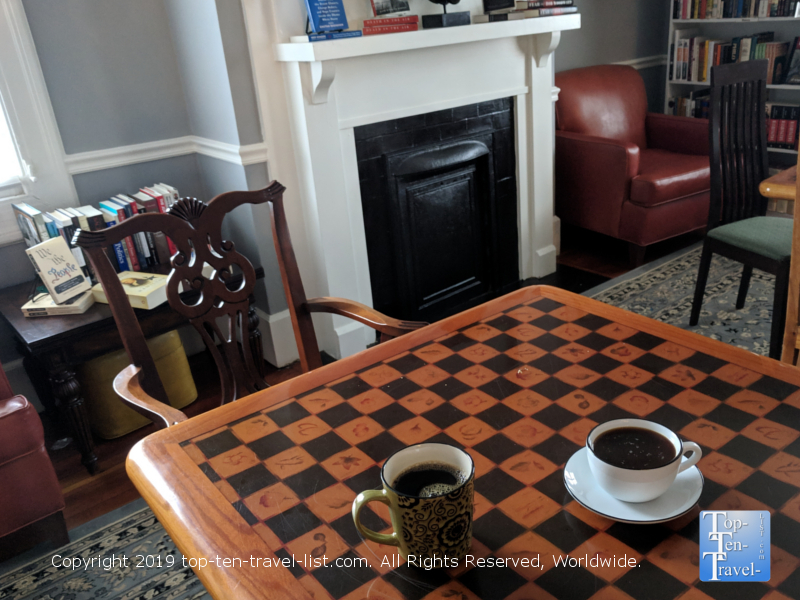 Joe’s Place – Relaxing library-like setting for a drink. Find a new book treasure while also enjoying a rich cup of coffee or a relaxing glass of wine. Orb Lounge – A sleek bar in the Hyatt Regency’s 8 story atrium. The Peace Center – The premier performing arts center in Greenville featuring over 10 Broadway musicals each season. Check out the 2019-2020 event lineup. Over 100 unique boutique shops, as well as common retailers, can be found up and down Main Street. The best-of-the-best are listed below. 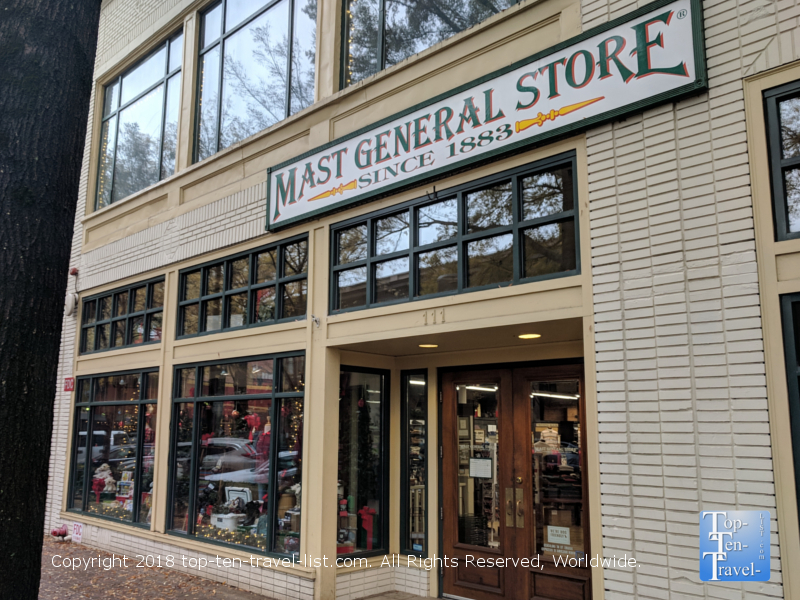 Mast General Store – This is the must visit in terms of unique shopping destinations in the city. 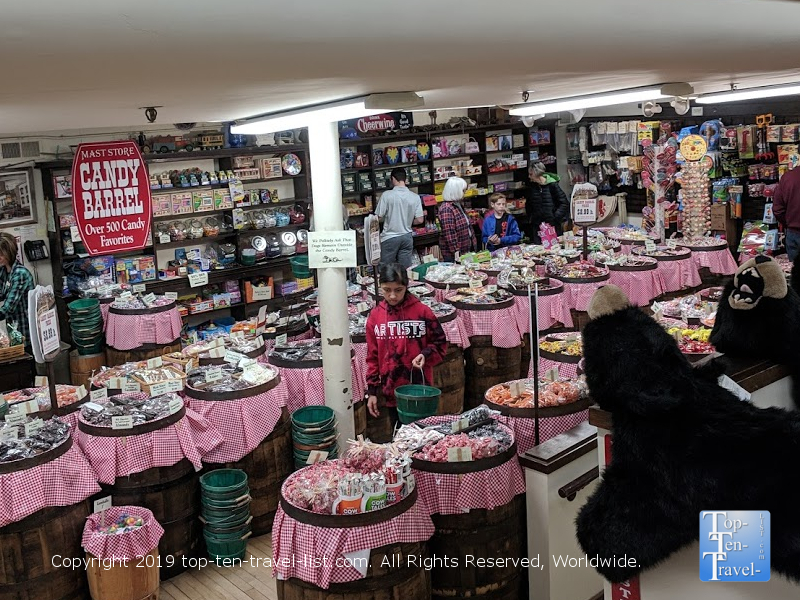 The old-fashioned general store is jam packed with all sorts of novelty items including SC and regional southern related knick knacks, an old time candy bar, nostalgic toys and games, and a huge selection of outdoor gear. Love the nostalgic candy counter – so many goodies from the past! 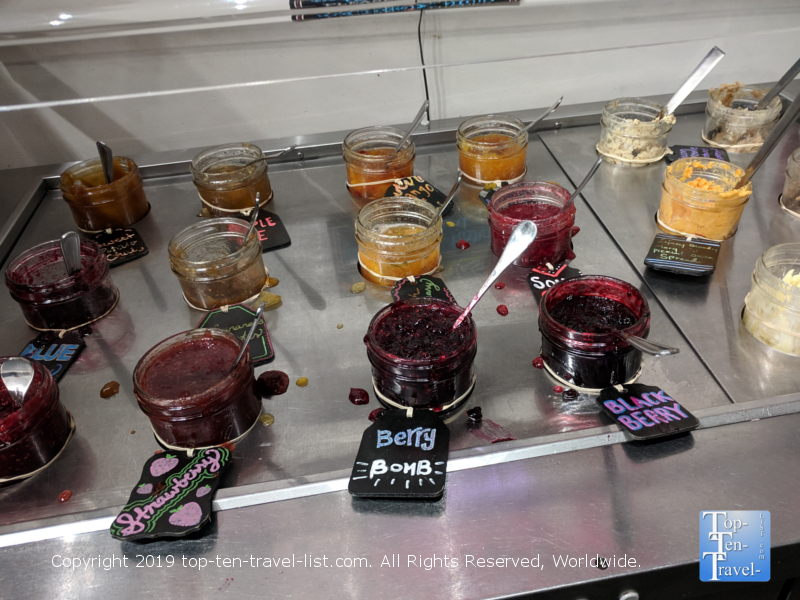 Oil & Vinegar – Locally owned shop where you can sample and purchase dozens of varieties of olive oil and balsamic vinegar. Great gift sets available for birthdays, Christmas, etc. 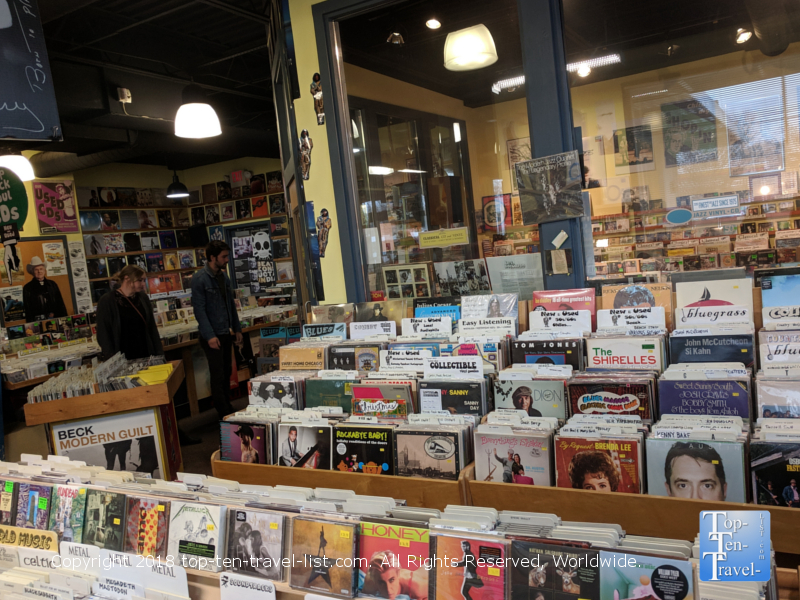 Horizon records – Offering both used and new vinyls, plus used DVDs and blu rays (most under 5 bucks). Tons of great record deals near the $10 price point. Attached to the shop is a quirky little local brunch favorite called the Bohemian Cafe. Poppington’s Gourmet popcorn– Delicious popcorn available in all sorts of tempting flavors (over 35 to be exact!). They sell the cutest holiday gift sets! Below are few of the attractions you will want to place high on your to-do list. 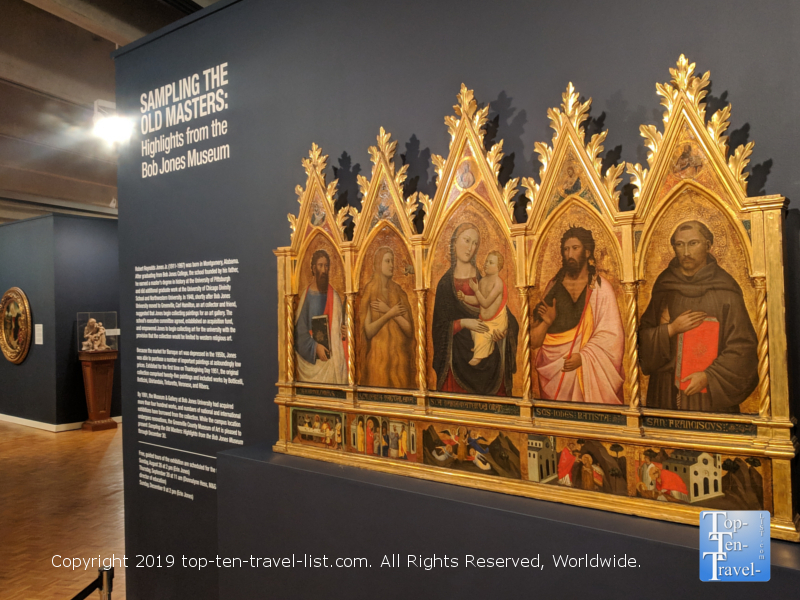 There is a bit of something for everyone, whether you enjoy theater, art, sports, or museums. 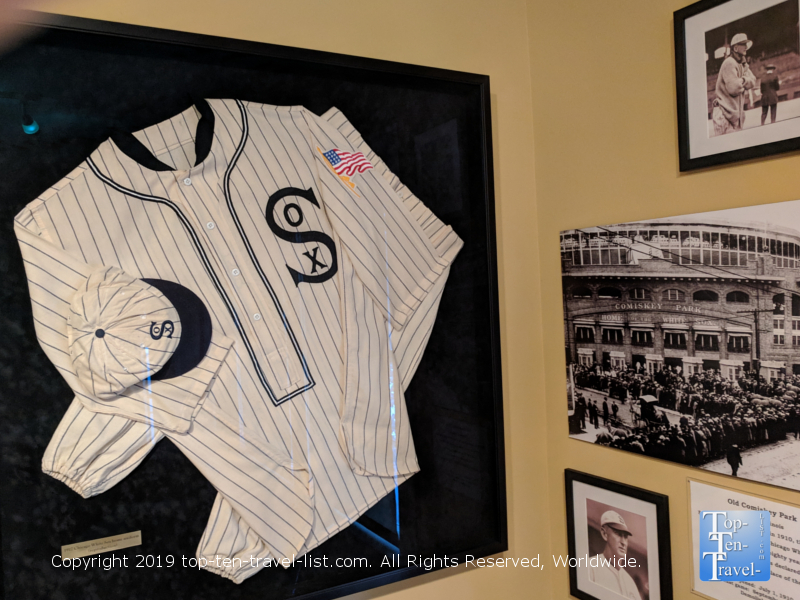 Shoeless Joe Jackson Museum – Shoeless Joe Jackson, most famous for the infamous Chicago Black Sox Scandal of 1919, lived & died in the Greenville area. His childhood Greenville home was transformed into a museum and relocated across from Fluor Field. Inside you can take a free tour or simply browse through the various memorabilia. Shoeless Joe received his nickname during a mill game. Joe had blisters on his feet from a new pair of shoes and proceeded to throw them off before going to bat. Fluor Field – Fluor Field is home to the Greenville Drive, a minor league team, Class A affiliate of the Boston Red Sox. Games begin in April and start at just 5 bucks. This is a great budget friendly activity on a nice spring/summer day whether or not you are a huge baseball fan. Mac’s Speed Shop is a touristy sports bar favorite right across the street. The Greenville Museum of Art – Although quite small, this local gem features the largest collection of watercolors from artist Andrew Wyeth. Admission is free and the museum takes no longer than an hour or so to stroll through. The museum’s current special exhibit features highlights from the Bob Jones University Gallery. Art in Public Places self guided tour – Scattered about the downtown region, you will find more than 70 unique art pieces. Many of these are very unusual and colorful. Download the handy Art in Public Places guide for your convenience. 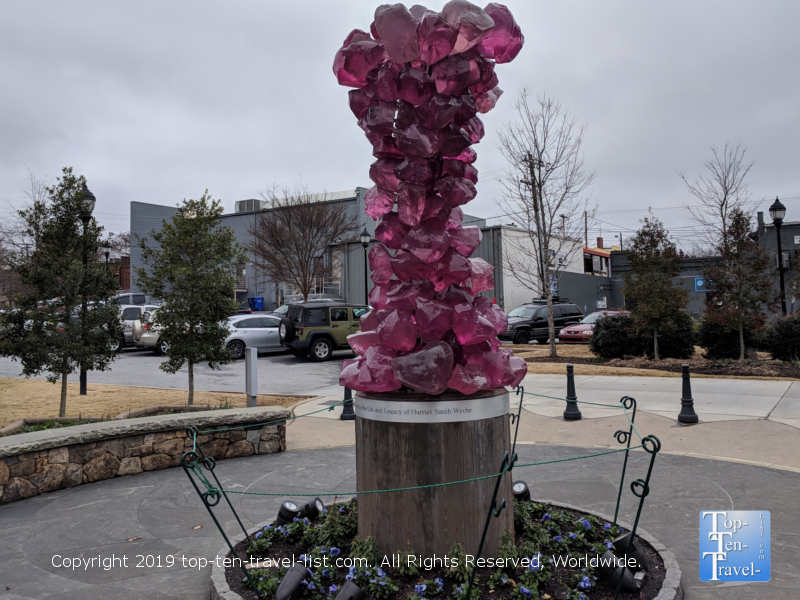 The Rose Crystal tower by artist Dale Chihuly (pictured below) is particularly impressive. 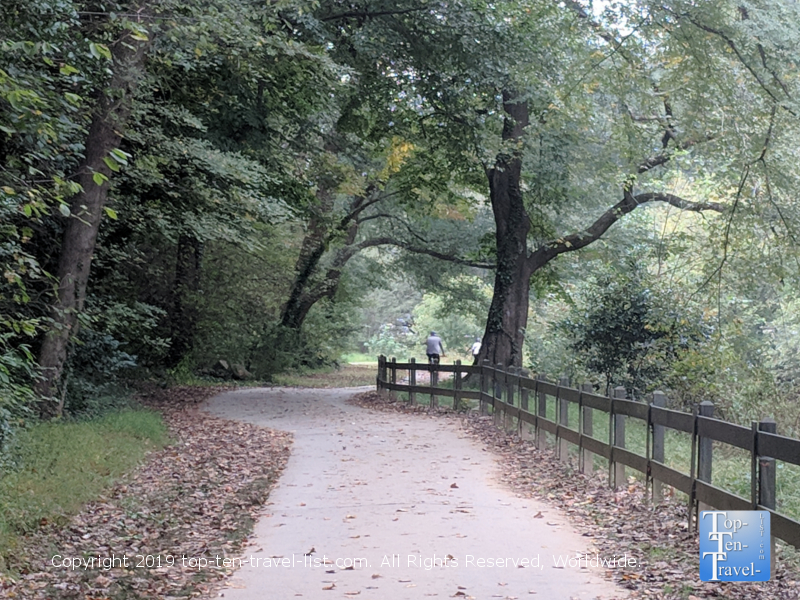 The Swamp Rabbit trail – This very popular paved recreational path runs a 19 mile course through several sections of Greenville, as well as a portion of nearby Travelers Rest, a small community just north of the city. Although exercising while on vacation may not sound all that attractive, the trail is a nice way to get in a relatively easy workout and enjoy the natural surroundings. If you do not have a bike with you, Pedal Chic (conveniently located downtown) offers half day rentals. Pictured here is a portion of the trail which runs just past Cleveland Park. Conveniently, you can bike from Cleveland Park right to Falls Park and save yourself the hassle of finding parking. 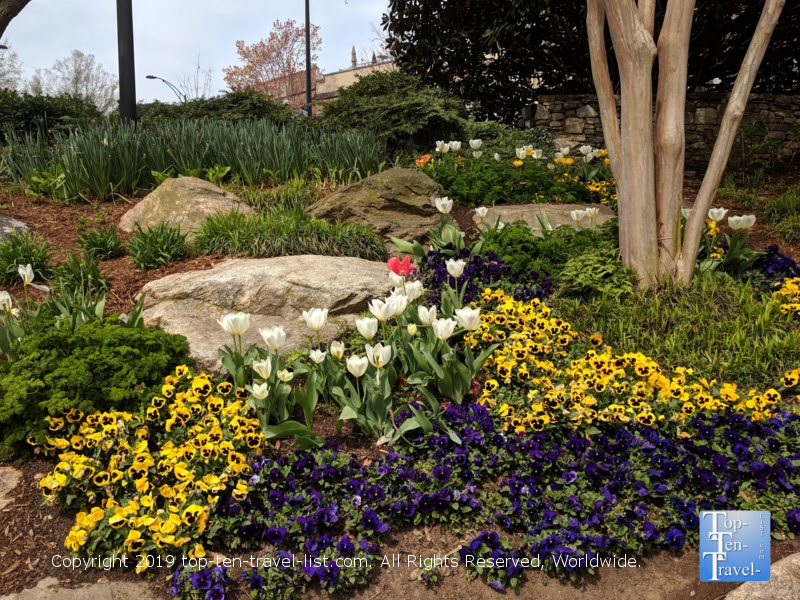 Cleveland Park – Cleveland Park is a small city park, home to the Greenville Zoo, one of the nicer sections of the Swamp Rabbit trail, a huge playground, picnic facilities, and over a dozen fun fitness stations. As one of the largest parks in the area, it’s a must-visit for nature lovers. Bonus: free electric car chargers! 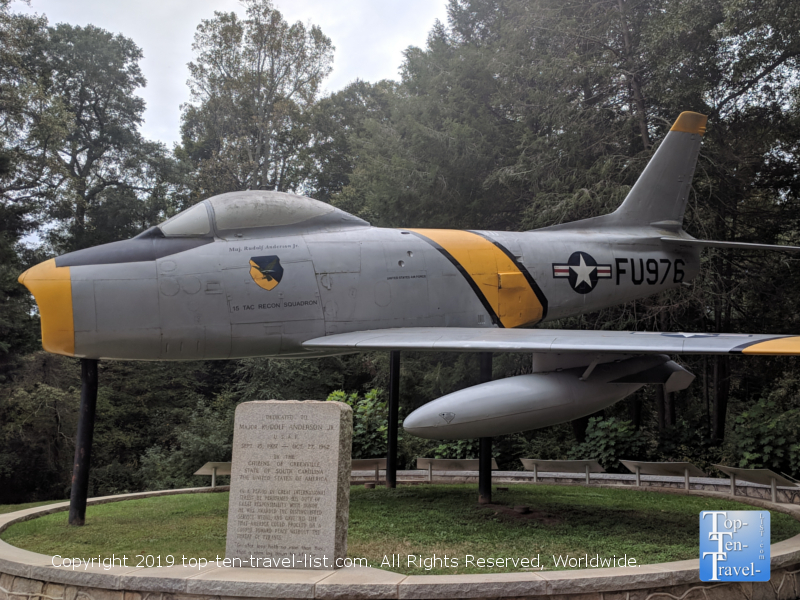 The Rudolf Anderson Jr. War Memorial is an interesting stop for history buffs visiting Cleveland Park. Joe’s Bookstore – Joe’s Place is a treasured local gem, a quaint bookstore/coffeehouse located in an old building in the historic section of town. Browsing through books here is like a step back in time – much more fun that your boring everyday Barnes and Noble, or worse shopping online. There are rooms and rooms of books of every possible interest, including a large selection devoted to rare books. Joe’s serves a full espresso menu, as well as wine and light snacks. Whether you feel like scanning rows of books for hours on end, or simply kicking back with a cup of coffee in a cozy setting, Joe’s has you covered. On nice mornings, you can linger with your coffee and a good book on the breezy patio. Downtown Greenville is bursting with events all year-long – over 300 to be exact! Most of the best take place during the busy summer months, although there is fun to be had year-round. Here are a few of the best-of-the-best to be on the lookout for during your visit! TD Saturday Market – This huge farmer’s market begins in May and runs through October. The setting is charming, being located right in the middle of Main Street with large trees cascading over the street. The market is quite large for a small city, featuring fresh produce, raw dairy products, and specialty foods from local farms. You will also find several art vendors on-site. Main Street Fridays – A free musical festival held from March-September at NOMA square next to the Hyatt hotel. 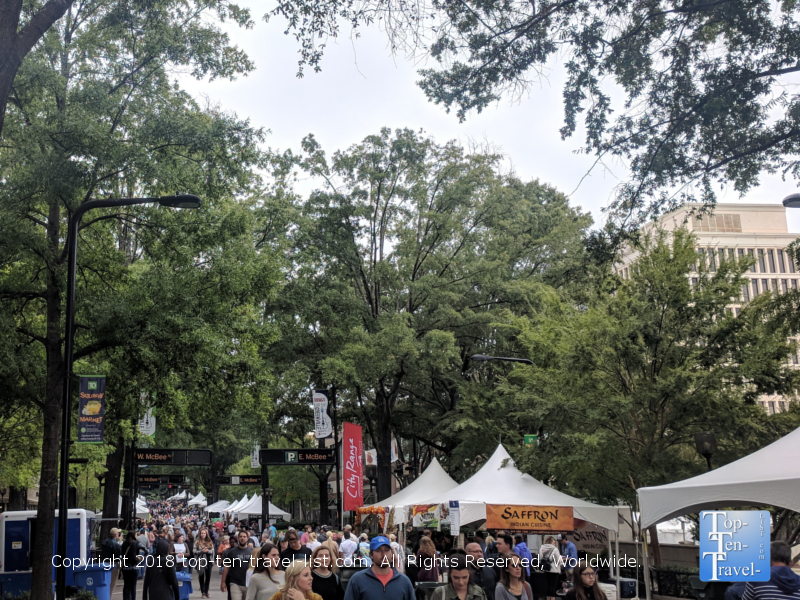 Fall for Greenville – Greenville’s most popular event allows you to sample cuisine from various downtown establishments. 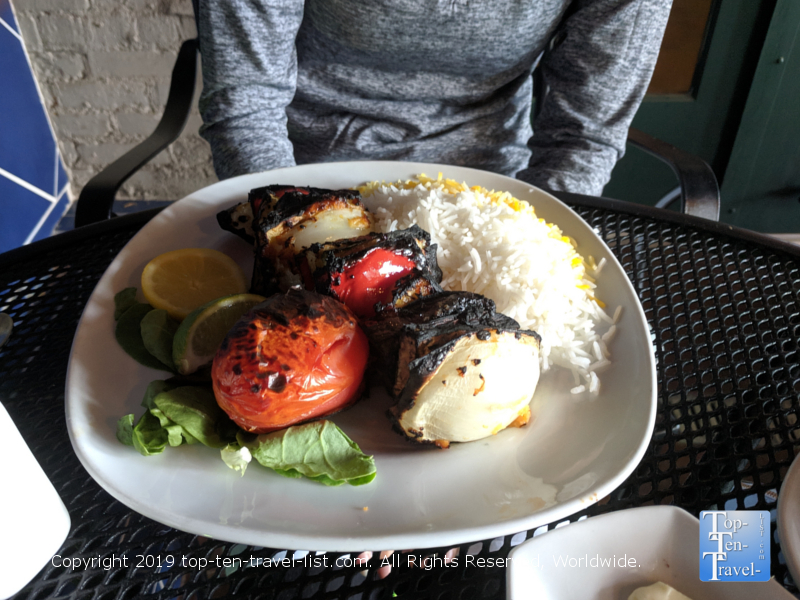 As there are so many restaurants to choose amongst downtown, this is a great way to test out a variety of dishes before committing to a purchase. 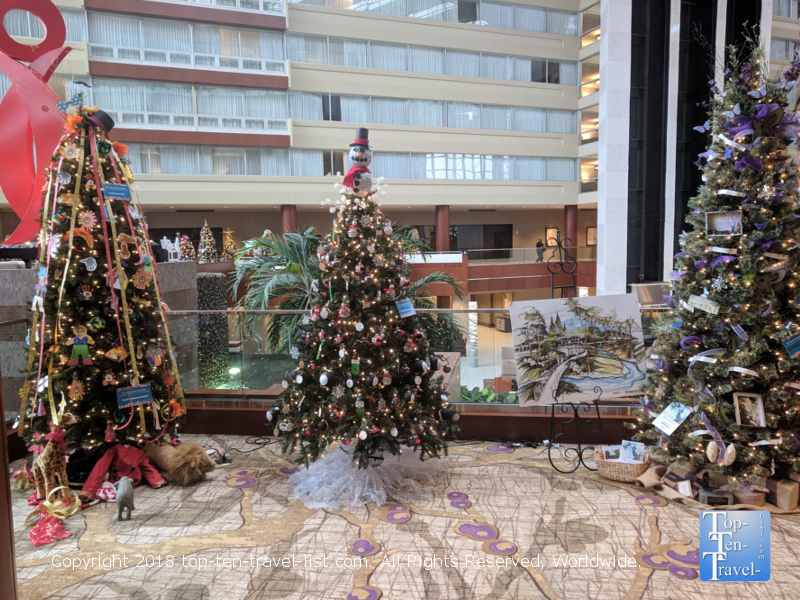 Festival of Trees – This festive holiday celebration features dozens of themed Christmas trees, displayed throughout 4 hotels. Head straight to the Hyatt Regency which features the most elaborate display of the bunch. Nice place to stroll around with a hot cocoa or coffee after dinner. 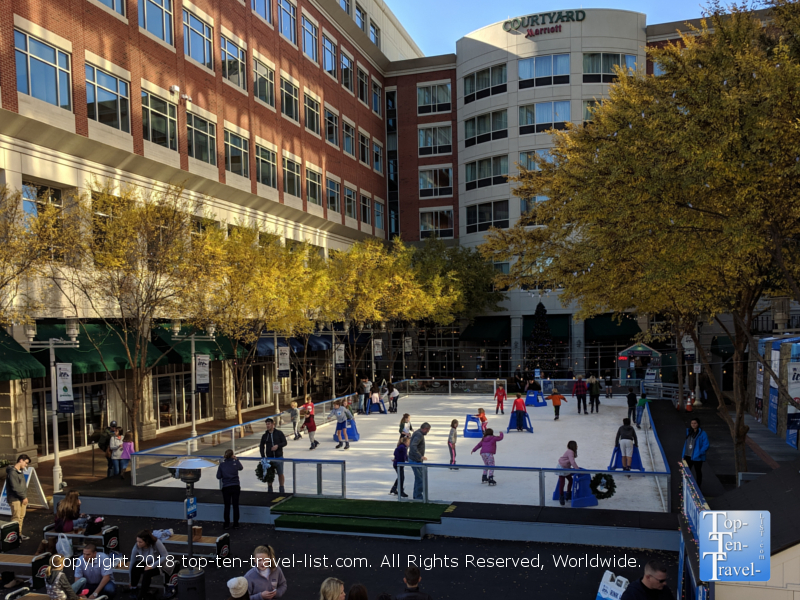 Ice skating on Main – A real ice rink comes to Main Street each December and stays busy until closing in late January. The brisk weather, the twinkling lights, and festive music will (almost) make it feel like the holidays up north despite the lack of snow. The rink was built to give visitors & locals more winter recreational options, and reportedly, was inspired by the Rockefeller rink in NYC. The Hyatt Regency, a 4 diamond hotel, is conveniently located within walking distance to most of the prime attractions. This is a gorgeous property with a beautiful 8 story atrium. Additional amenities include a great on-site farm-to-table restaurant, a Starbucks, and a decent pool.